We have added another line of Fingers to our database, Charles Finger who came to Illinois from Germany in 1859. He married Margaret, who was born in Canada and they had 6 children. Most of his descendants remained in Illinois, although around 1910, some moved to Nebraska, but then moved back to Illinois. I posted a newspaper article about Ralph Fingar, who, in 1935 at the age of 10, saved the life of a drowning man. I am a descendant of William Finger and Elizabeth Heidenreich (my great-grandparents). George H. Craven (d. 1972) was my father. He dropped his middle name, Heidenreich, during the 2nd World War, as he was a major in the U.S. Army, and didn't want the German name any longer. I have a lot of information about my family. It is an interesting bunch, with many musicians, writers and scientists. This is the line of William Finger (WI1835) who first arrived in the U.S. in 1861. I asked if she might send some additional information for our website. Today another line of Fingers was added to our website. Louis Finger, born 1869, came from Russia to Delaware in 1885. This is a Jewish family. Some of the descendants went on to become lawyers in Delaware. We have a picture of a grandson, Louis J. Finger, (1925-2008). Walter Dennis sent us some updated information about Michael Draper, and a picture of Viola Fingar, born 1905. I have just come back from a trip to the National Archives in Washington, D.C. and have a few updates to report. Added another family line, Max A. Finger who came to Chicago in 1884. Found that Smith Finger's wife's maiden name was Elmira Allew, and that she had been previously married to John Dickman. Elmira and John had a son Joseph, who became known as Joseph Finger and who served in the Civil War by that name. Found another line, that of Julius Finger, b.1865 who came to Michigan in 1882 and who served in the Spanish-American War. However he had no children. His wife Maria had been married previously to Matthew Eichhorn and their 2 sons Ernest and Leonhardt were listed as Fingers on the 1900 census and as Eichhorns on others. Added the line of Bernhard Finger who came to Iowa in 1848. Bernhard was a clerk, a bookkeeper, a Justice of the Peace, and a Notary Public. We find him in Iowa up through 1885 and in North Dakota in 1900. Some descendants went to Minnesota. I don't know where to start tracing back our family line. From what I know my great grandfather was Irish and I think his name was Edward and he lived on a farm in the Bloemfontein area and he married a Basotho lady and had sons. One was my grandfather Edward Finger. He also had a brother who was arrested and hanged during the apartheid years for murdering a policeman. Edward Finger had two sons from Jane Margeret Hops(nee Khalil), Anthony Finger and Ralph Edward Finger. I know Bloemfontein has many Fingers in the phone directory but I don't think they related to us. A bit of help in tracking my line would be of great help. I suggested she first interview all her relatives and put the info into a genealogical database, then see if there is a Mormon church nearby. If anyone is able to further help her, just let me know and I'll put you in touch. It is with great sadness I report my mother, Flossie Pearl Finger, passed away 9/26/2010. That leaves the one sister, Hope, still alive. Unfortunately we need to update the Fingar Family. My husband, Gregory Fingar, passed away September 1. Cheryl Morrison alerted us to this page about the Germantown Tricentennial (1710-2010) and featuring Peter Fingar. The database has been updated. More family members have been added, we now have 10,517 relatives on line. There are 2,700 with the name Finger and 280 Fingars, for a total of 2,980. In addition, there is another family line we have found, Patrick Finger who came to the U.S. in 1884 from Ireland. He, his wife Annie, and children James, John, Veronica, and Cecilia are found on census records in California starting with 1900. Bill Bilkey sent us this interesting newspaper article concerning Henry Finger (b.1842) who, at age 81, was on his roof repairing the chimny and replacing shingles. 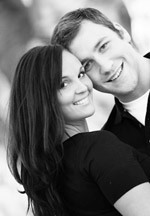 HEYWORTH -- Valerie Dunham of Heyworth and Michael Finger of Wapella will be married June 5, 2010. Unfortunately, we don't know how Michael is related. If anyone can help, please get in touch. Meanwhile, congrats to the new couple! Marcos Paulo Finger from Brazil found our website and sent in some additional information about the Fingers in Brazil. We have found and added another family line, that of Rudolph Finger who came to Wisconsin from Germany in 1885. Also we have more pictures, Warren Finger (b. 1860), his daughters Eloise, Estelle, and Hortense; and his mother Caroline Lamphere (b. 1833). And in another line, Edward Anton Finger (b. 1881). Thanks to Jeannie Kempf Techlin we have some updated information on the Gottfried Finger line, most of it concerning descendants of Gottfried's daughter Pauline Finger who married August Kempf. Included is a picture of August and Pauline and their children, taken about 1910. My newest granddaughter, Elissa Finger is doing well, here is the latest picture of her and her father, Richard Finger. We start the new year on a positive note, the newest member of the Finger family is my granddaughter Elissa Carol Finger who was born at 11:45 a.m. in Ketchikan, Alaska to my son Richard and his wife Shasta. Born 3 weeks early, she measures 19 inches and weighs 5 lbs., 8 ounces. Mom and daughter are doing well. The parents chose the middle name Carol in honor of Richard's sister Diane Carol, who passed away in 2008.